The first time I traveled to Europe for an extensive period of time, I brought two large suitcases, a small duffle bag and a large tote. Since those early days of over-packing, each time I head to Europe for more than a month, I try to pair down how much I carry. Lugging suitcases on trains, planes and across cobbled cities while dodging tour groups is every traveler’s hellish, sweaty nightmare. Those condensed packing lists advising to just pack two T-shirts, one tank top, three dresses and four pairs of underwear aren’t up any sort of alley I want to be on in the first place. Traveling around Europe, you will standout like a sore thumb if you don’t care about what you are wearing. While it would be nice to throw on what you would back home, I am a firm believer of trying to dress for where I am to avoid offending the locals, receiving those judging stares and simply to be treated well. 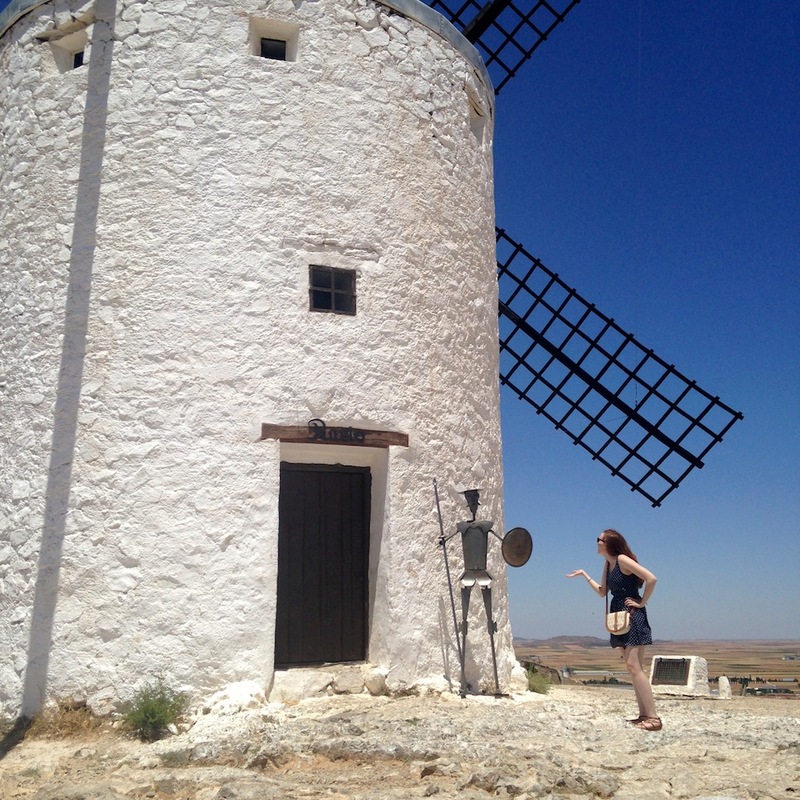 When you run into Don Quixote in Spain, you can’t be wearing just any old thing. Then, the challenge of trying to be compact for three months of travel walks into the room and puts the kibosh on any semblance of fashion. Luckily, after countless extended trips, I think I have uncovered an easy recipe for success, the number 7. Simply stated and easily carried out, I packed mostly 7 items of each area of clothing. If you are planning to travel around Europe for at least three months in the spring, summer and early fall and you want to travel fashionably, here is how I am achieving compact, fashion success with an 18” carry-on sized suitcase and a tote bag. Dresses are one of the best items for women to pack to Europe in the summer. You always look more put together and fashionable with very little effort involved. I packed three maxi dresses, all solid colors. As they are longer and I am traveling for a long period of time, I didn’t want to get sick of a pattern head to toe. However, with short dresses, I mixed in my patterns. I packed four short dresses, one polka dot, one floral, one print and a romper that I consider in the dress category. Plain colored t-shirts are every traveler’s go-to while traveling for a long period of time. You can always dress them up or down depending on where you are going and what time of day. I packed white, black, gray, light pink/peach, turquoise, navy and royal purple t-shirts. By mixing and matching, all of these colors go with the bottoms I packed. This striped tank-top goes well with Italian pizza. I packed my tank tops similar to the t-shirts. I went with basic, neutral colors so that I could mix and match to create different outfits or to wear them under some of the blouses that I brought. I packed a peach, white, two black, two striped and one cream tank top. To keep my outfits looking less one-dimensional with solid colored t-shirts, I threw in seven more fun blouses. These coordinate with all of the colors that I brought, but have more patterned work or detail than a t-shirt. And as it is summer, I went with very light fabrics to save even more room in my bag. My blouses were peach, citron, royal blue, teal, two cream colored and a floral print. The bottom department was something I could have edited better after being in Europe now for almost a month. I needed more cold weather clothes in the beginning. However, I did pack, one pair of jeans, one pair of black pants, three pairs of shorts (olive green, black and citron) and one yoga pant. While I am now battling the heat in Spain and cold weather isn’t an issue, I do wish that I packed an extra pair of jeans and eliminated one of those pairs of shorts. Rounding out my bag, I packed two pajama sets, one statement necklace and three pairs of shoes. I packed one sandal, a tennis shoe and one foldable flat. I have also been wearing a simple caramel colored leather jacket, which goes with everything and always look sharp. In order to pack fashionably for several months in Europe in the summer, I also selected several colors to pack. I included the basic neutrals of black, white, cream and gray. To add some color, I packed items with peach, citron, turquoise and navy/blue. So far, everything has mixed and matched well, essential if you want to pack light but also look the part of a stylish European. My packing list might sound like a lot, but everything fits in my tiny carry-on sized suitcase. It is actually one of the smallest sizes for a rolling carry-on at just 18 inches. I packed the number seven not just at random. As there are seven days in a week, I reasoned that I would be packing enough clothes for a whole month, meaning I would only need to do laundry roughly three to four times on my travels if that. For a full week, I could wear dresses. For another three weeks, I could wear all of my top and bottom combinations. I have 28 outfits in one bag. I am not limiting myself to one or two of certain items. This kind of formula can be followed for anywhere from one to four months in Europe during the warmer months of the year. I intended to publish this packing list before I even left for Europe. However, I waited to see if this rule of 7 would actually work. In the end, I am glad I waited as I would advise adding a few cold weather items, namely a rain coat, an extra pair of jeans as mentioned and a long sleeve shirt or two in the T-shirt category instead of all short sleeves. I also would have added a large scarf or pashmina for covering up in churches so that I wouldn’t need to lug my leather jacket everywhere. Overall, I have been able to zip up my bag with little effort, traipse around ancient cities without thinking my arms will fall off and look and feel fashionable with very little math needed to get there. How do you pack fashionably without over-packing for long trips? I plan on stealing your rule of 7s for my next jaunt! Packing light is an aspiration many of us frequent travellers have but sometimes it just doesn’t work out that way. I really like how you approach this Suzy, you show respect and forethought for where you are going to visit. You also have a good selection of clothes, I love that white dress! Sadly it is often easy to spot some poorly thought out dressed American in a foreign land. I can often identify them very easily before they even speak, purely down to their choice of clothing. Wow! I do a lot more laundry on my trips, but I also have other clutter like binocluars and this trip even fins, snorkel and mask hogging up space. I wish it were tank tops and maxi dresses, because those are a lot lighter! 🙂 Enjoy your week or your weekend! “Those condensed packing lists advising to just pack two T-shirts, one tank top, three dresses and four pairs of underwear aren’t up any sort of alley I want to be on in the first place. ” Saaaaame here! This post is totally up my alley. I’ll be in Europe starting next month for 6 weeks and will seriously follow your rule of 7! Thanks for sharing. I absolutely love that white maxi dress! It’s gorgeous! Ah, love finding a kindred spirit when it comes to balancing bringing only a carry on with not lowering the fashion bar just because you’re on the road. Great post and awesome blog! Really good ideas here, Suzy, and I like your suggestions after actually trying the clothes out. When I was last in Europe in the summer, it was much colder than I had expected, so I can see why you wished for that extra pair of jeans and long-sleeved t-shirts. I think one or two cotton cardigans would be a good addition – one short, one long. Personally, I’m always freezing (except when I’m dying of the heat – there may be about 1-2 degrees of range where I’m comfortable…). Gorgeous maxi dress! Where’s it from? Sorry! Just saw your question. It is from H&M! Thanks for this!!! But what about footwear? I usually wear boots for the plane so as not to have to pack them, but are there other shoes you find that you need/want besides maybe black flats? I always end up packing too many shoes. Shoes are the worst for packing. I would try to eliminate as much as possible. I usually pack no more than three pairs if it is a long trip (wearing one packing two). If it’s summer, that consists of a sandal that can dress up or down, a walking shoe/athletic shoe and a foldable flat. For winter, I wear boots on the plane, pack one bootie and maybe a flat if that. I think the key with packing shoes is elimination. Thanks! I hope you have figured everything out by now for your upcoming trip. I certainly went with fabrics that weren’t bulky so that I could bring more options but not by taking up more space. I totally agree with most of what you say. I love clothes & when I’ve traveled extra light I’ve inevitably regreted it. My problem, however, is shoes! No way could I take that many ….. Perhaps it’s my huge size 41 (Spanish size) feet. Dunno but it’s always a problem! I definitely didn’t bring 7 pairs of shoes ha! Shoes were the exception to the Rule of 7. I wore a pair and packed two others. I really appreciated having a foldable flat as one of those pairs of shoes. I could fit it in my tote and save the room in my carry-on. You got 35 pieces into an 18″ carry on?!? That’s magic. Yes! It was actually pretty simple if I paid attend to fabrics that weren’t bulky and kept the extra space hoarders like shoes and toiletries to a minimum. Packing cubes also made this possible. I know this is an older post but I had to say how impressed I am with your packing list. Your choices actually increase your outfit options exponentially. If everything mixes and matches you can wear every top with every bottom and have 49 different outfits right there (7X7=49). Then if you’re layering you’ve probably got more combinations than you’d ever need. Wow! What a great rule of 7.